…and I’m not talking pumpkins. Garlic. It keeps vampires away, right? So you’re definitely going to want to have some around. What to do? Get non-toxic glue, a toothpick and a bunch of plastic spiders. 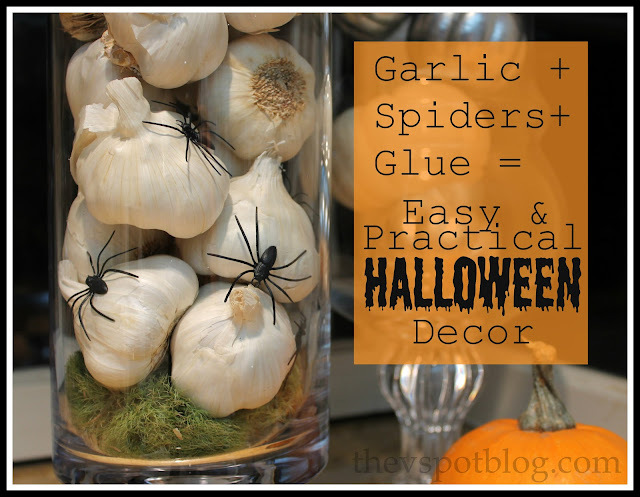 A little dab of glue on the spider’s body will adhere it to those papery outer layers of the garlic. 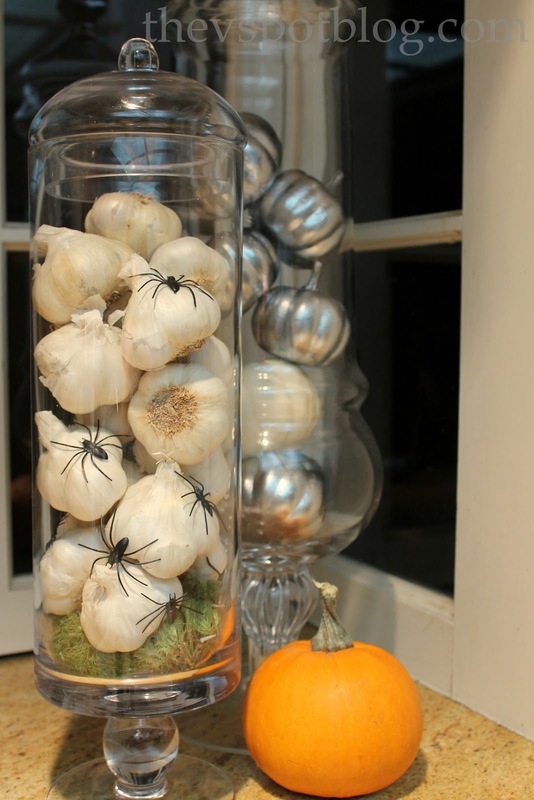 I added the spiders to the garlic and layered them carefully into an apothecary jar. Because there are so many of those papery layers, the little dab of non-toxic glue won’t affect the garlic at all. Once Halloween is over, I’ll just pop those spiders right off and toss the garlic back into my garlic bin. And at 3 for $1, this is a very, very cheap and easy way to add some Halloween decor to your kitchen. Ach, garlic how I love you! From the moment we first met and fell in love you have flavored my sauces, pot roasts, mashed potatos, burgers and fries. I use you often and liberally. Now I discvcer that you have been holding out on me and could have also been cute and spooky and perfect. Its ok garlic, Ill get over this betrayal and we’ll be together again soon…. Like maybe lunchtime? Love this one! Where did you get the spiders? They’re not the typical cheesy looking fake spider. I love your spiders 🙂 You always have such great ideas. Love all the potion bottles below, and the batty wall! Now who the hell would have ever thought of that?! That seriously is so so cute! Just looks perfect. I think I have run out of counter space for decorations unfortunately. What wonderful, elegant Halloween decor. Love it!